Your exhibit materials are critically important to your trade show experience. Ensure they are protected from the worst case scenario with these tips. Planning for exhibiting at a trade show takes months of dedication and preparation for every possible scenario. Displaying your services and products to prospective clients can have a huge impact on the success of your business, so this planning process should be given serious thought. However, as you’ve mulled over the possible scenarios that could unfold, have you considered the worst-case scenario and how you might prepare should it occur? While unlikely, it’s important to also have a plan in place for this contingency – loss and damage to your trade show assets can occur, and exhibitors can be left on the hook for financial damage due to liability limits, even when such loss is not their fault. Protecting your assets takes some planning, but can pay off in the long run. Here are a few tips to help you keep your exhibit materials protected. Companies looking to ship exhibit materials to a trade show site should understand who has responsibility for the freight at any given stage of the process. Your primary points of contact during the transportation process are going to be your carrier and your general service contractor (GSC). The carrier will be responsible for your freight once it has been loaded onto the truck and is on its way to the show site or advanced warehouse, as well as its return to you. Carrier liability is generally limited, ranging from $0.50 to $5.00 per pound, though insurance is also available. The GSC becomes responsible for your materials once the shipment has arrived at the show site or advanced warehouse. While exact values may vary depending on the policies of the GSC, you can expect their liability to be limited to about $0.50 per pound, per article, with a max liability of about $1500. Insurance is crucial to protecting your company and your assets from the effects of worst-case scenarios. During the planning stages of preparing for a trade show, it’s worth reviewing your current policy thoroughly and making any adjustments as needed. Exhibitors commonly believe that their material assets are covered through the company’s business personal property coverage. 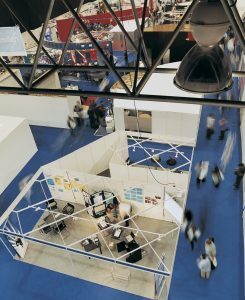 However, there may be restrictions on coverage once property leaves your premises to go to a trade show site – in some cases, coverage may not exist altogether. Contact your insurance provider and fill in any gaps in coverage as needed to ensure protection when your material assets are in transport as well as once it has arrived at the trade show site. While every booked shipment will be covered by a limited liability plan, this often will not be enough to insure the products at full value. Some carriers, however, do offer supplemental insurance and general liability plans, and these can be worth examining in greater detail. Just be aware to request the coverage inclusions when inquiring about supplemental plans. One of the most important documents in the shipping process is the Bill of Lading, which includes key information about a given shipment as well as general statements on limits of liability for the carrier or decorator. On this document, all parties must notate the condition of the items in the shipment upon receipt. Never sign a document without reading the fine print first. Notate any problems or damage you may see at every stage of the process. If you can, it’s worth taking photographs of your goods before they leave your location and ask the carrier to take photos as well. Photographs can assist your company should you have to resort to the freight claims process. In addition, you should document the value of your shipment and understand how much the value of your items can depreciate when damaged. Documentation is very important should the worst-case scenario come to pass. This entry was posted on Friday, September 28th, 2018	at 10:19 am	and is filed under AFP Expo, Trade Shows	. You can follow any responses to this entry through the RSS 2.0	feed. Both comments and pings are currently closed.